Instead of tilling a field, no-till involves leaving the crop residue on the field to decay before re-planting and then seeding the field again without tilling. No-till farming can also involve planting a cover crop during the off-season and then seeding without tilling. Farmers are investigating no-till techniques as a way to improve their soil, closely manage irrigation and the application of fertilizers, minimize runoff and increase crop yields while saving on fuel and labor costs. NIR field spectroscopy can help to better understand and characterize soil properties including soil moisture, clay content and identification, total organic carbon (TOC), total nitrogen, cationic exchange capacity (CEC) and other properties. For example, in a typical soil sample, TOC features would appear at 1100,1600,1700-1800, 2000 and 2200-2400nm. These wavelengths could then be used in chemometrics software to provide a quantification of organic carbon in the sample. 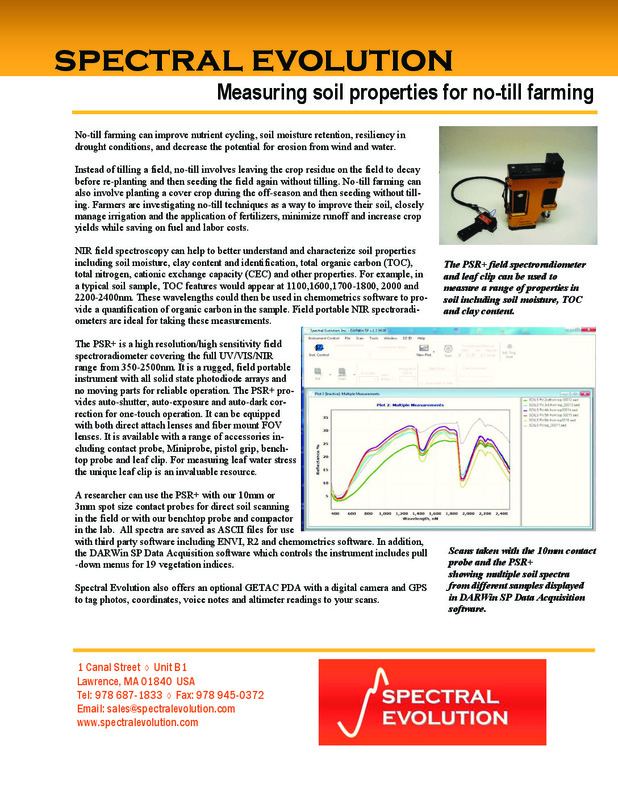 Field portable NIR spectroradiometers are ideal for taking these measurements. 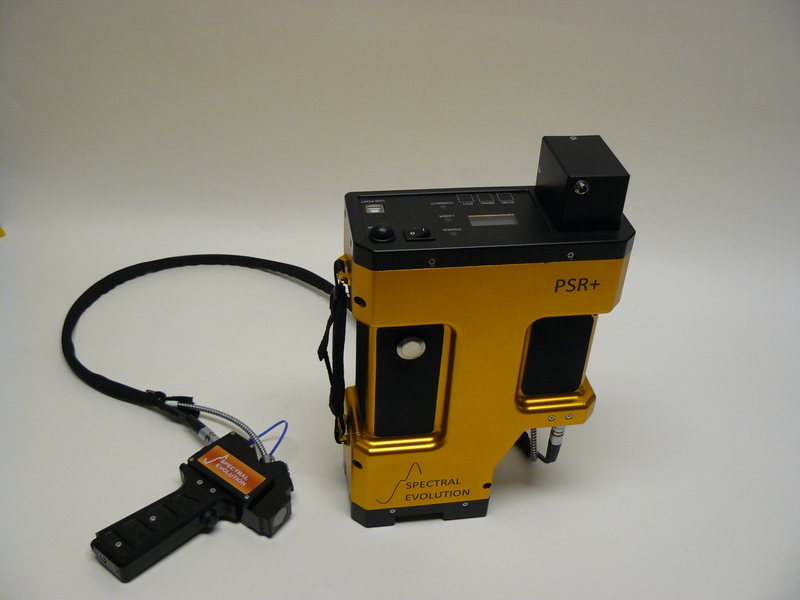 The PSR+ is a high resolution/high sensitivity field spectroradiometer covering the full UV/VIS/NIR range from 350-2500nm. It is a rugged, field portable instrument with all solid state photodiode arrays and no moving parts for reliable operation. The PSR+ provides auto-shutter, auto-exposure and auto-dark correction for one-touch operation. It can be equipped with both direct attach lenses and fiber mount FOV lenses. It is available with a range of accessories including contact probe, Miniprobe, pistol grip, benchtop probe and leaf clip. For measuring leaf water stress the unique leaf clip is an invaluable resource. A researcher can use the PSR+ with our 10mm or 3mm spot size contact probes for direct soil scanning in the field or with our benchtop probe and compactor in the lab. All spectra are saved as ASCII files for use with third party software including ENVI, R2 and chemometrics software. The PSR+ can be used with our 10mm or 3mm spot size contact probes for soil measurement in the field or with our benchtop probe and compactor for analysis in the lab. Click here to download our No-till Farming Application Note.